Chain may be hitting safety cover, frame, etc. Locate the source of the noise and make corrections so that the chain is not making contact. Chain is running in a place where guide clearance with the wearstrip is tight. Locate the tight part, check for temperature-related expansion and/or deformation of the wearstrip, and make corrections. 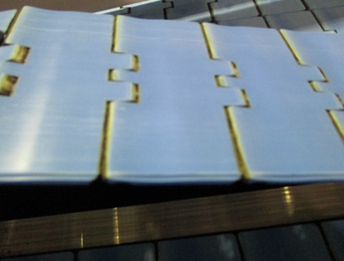 Wearstrip surface finish is rough or dimensions and/or materials are inappropriate. Replace with wearstrip that has smooth surface finish, that is dimensionally accurate, or made from appropriate material. Chain direction of travel is backward. Lubrication is inadequate or operating conditions are too extreme. Make changes in the lubricant and/or lubrication method. The location and/or spacing of return rollers and/or size and/or position of the catenary curve are inappropriate. Idler sprocket and/or return roller not spinning smoothly. Take corrective measures such as employing bearings so that they spin more smoothly or increase their diameter. 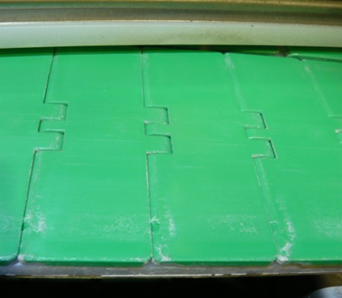 Foreign matter adhering to the wearstrip is impeding smooth sliding. Clean wearstrip to remove foreign matter. Chain is catching or snagging on obstructions and/or on sharp edges at the ends of wearstrips. Smooth out the sharp edges and remove obstructions. Increase the diameter of return rollers or change their specifications. Small return intake radius R, or diameter of return rollers is too small. 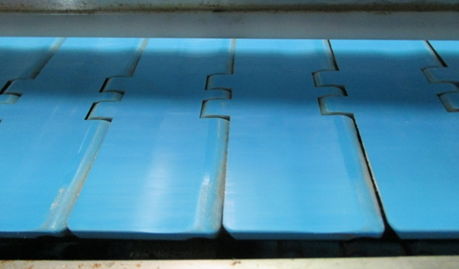 Return wearstrip surface finish is rough or layout and/or materials are inappropriate. Correct layout so that wearstrip made of appropriate material with smooth surface finish makes uniform contact across the chain width. Rough or gritty spots that promote friction are adhering to the return rollers or wearstrip. Clean the conveyor. Take measures to identify the cause. Guide rails and/or obstructions are causing damage. Identify the obstruction and make corrections. 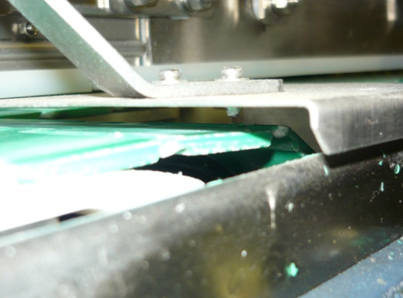 Foreign matter is adhering to or embedded in the carry-way wearstrip, and damaging the chain. Remove foreign matter and clean. Surface finish of carry-way wearstrip is rough. Make changes to surface finish or replace with appropriate wearstrip. Replace with sprocket if necessary. Position of sprockets or wearstrips inappropriate. Surface finish of curved wearstrip is rough or material Is inappropriate. Replace with wearstrip made of appropriate material with smooth surface finish. Insufficient lubrication or operating conditions too extreme for curved conveyor. Make changes to lubrication method. Pins and links have become bent as a result of overload, etc., and scoring (galling) has occurred. Remove and replace the stiff sections or replace with a new chain. Chain caught or snagged on foreign matter or obstruction. Remove foreign matter and obstructions. Deterioration caused by chemicals or high temperatures, brittle fracture due to or corrosion. Identify cause and modify operating conditions or change the chain material. Caused by excessive wear elongation of chain. Replace the chain. Operating conditions too extreme and chain was subjected to catastrophic excess tension. Determine the cause and take corrective action. Check plug condition. Replace with new plug. Adhesion of dirt or other contaminants. Deterioration due to exposure to chemicals, high temperatures, ultraviolet light, etc. Check operating conditions and replace with chain made of appropriate material. Surface finish of curved wearstrip or other component Is rough. Modify specification for curved wearstrips. Sharp edges at ends of wearstrips or obstructions are abrading or gouging the chain. Presence of rough or gritty spots. Identify the cause and take corrective action. Foreign matter has accumulated on roots of sprocket teeth. Remove the foreign matter and clean. Sprocket has shifted out of position or is misaligned. Defective sprocket (damaged, deformed, swollen, corroded). Investigate the cause and re-check specifications. Replace as needed. Damage around the hub of split sprockets. Check for loose or over-tight sprocket bolts. Check that bolts have the proper tightening torque when replacing. Make the guide angle gentler. Change the position of the guides. Make corrections to speed and lubrication. Check level. Make changes if necessary.